The kettlebell get up sit up exercise can be difficult for beginners. Like other floor/laying down exercises, it is a great way to workout your core muscles. The kettlebell weight you choose to use with this exercise can alter the difficulty greater than other standing up exercises. So be sure to choose an appropriate weight before you begin. 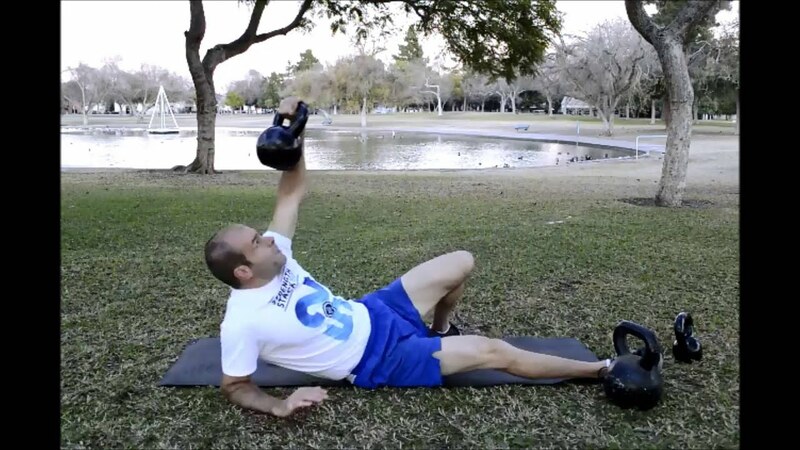 Start off by holding the kettlebell handle straight up in the air in the laying down position. The bell should be resting on your forearm on the side closest to your head. Whatever arm you are holding the kettlebell with should have that same leg bent at the knee with your foot on the ground. Using your free hand for balance, drive your upper body forward in a sit up position keeping the kettlebell straight up in the air at all times. Complete the rep by returning the laying down position. The recommended amount of reps to perform with this exercise is 6. Once you complete the first set of reps, switch arms to perform the second set. Don’t try to rush this exercise as it is one of the more tiring exercises for kettlebells.